“You couldn’t make this up” said one of my team mates, only hours before the self-proclaimed ‘Toughest Event on the Planet’ was due to begin (since then the slogan has travelled down Carlsberg Lane by sensibly introducing the key word ‘probably’). Once Gerry confirmed the news of an absolute calamity, we begrudgingly accepted that the unthinkable had really happened – it was squeaky bum time. Rewind to May 2012. The owner of my old gym in London threw an intriguing question into the mix, asking who was interested in joining a crack commando unit by way of representing the establishment in Tough Mudder. Having heard of the event and after watching a few glorified You Tube clips, my hand went up faster than an Alaskan salmon evading the attention of hibernation starved grizzly bear. I soon embarked on my first TM-specific training session. It was held outdoors and alarmingly, although it was late Spring, I was freezing – relatively speaking – as six years of residing in Australia had softened me to the core. With the main event being held in November, combined with a North England venue, my dynamic warm-ups were uniquely supplemented by a combination of frowning and cursing. A significant dosage of toughen-up juice was required and I received it through a flashback of the old Yorkie bar slogan “It’s not for girls”. As an aside, this was something which once comically puzzled my late father. In his Cypriot accented English he picked up a bar and bafflingly asked, “Savva, why it’s not for girls?” I replied with a smile on my face, “Don’t worry Dad” and added, “it’s just a thing.” Extremely insightful on my part. I digress – back to the training. I’ll set the scene. 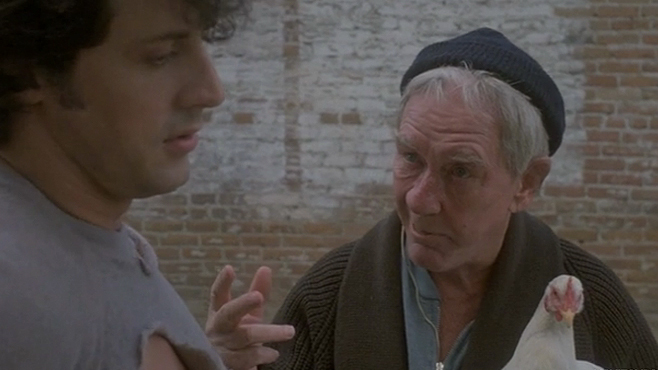 Not too dissimilar to one of the older Rocky movies but without any chickens to chase, no Mickey fiddling with his hearing-aid and no accompanying fanfare. Shame really. The location was in a quiet corner of an old, unkempt industrial estate. In places, fragments of broken glass covered the unforgiving, heavyset, concrete ground. Throw in sporadic, foot-long weeds spurting from cracks in the surface and you get the picture. Frequently, the warm up began by rolling a 200kg lorry tyre from its resting wall position into our training circuit and, very occasionally, I would participate in a game named ‘spot the bullet shells’ (I found one once) from the nearby walls. The training itself was intense. Kettlebells, the infamous giant tyre, heavy hammers, metres of heavy-duty iron chains and a one-piece, solid-plated weight vest were generally on the agenda. Incidentally, I think it was the same vest worn by Marty McFly in his High Noon showdown with Buford “Mad Dog” Tannen in Back to the Future III. Although, we were well aware that none of these items represented a single obstacle in Tough Mudder, they were excellent training tools nonetheless and highly recommended. Scarcely half an hour after the session commenced, a sizeable degree of communal hurt would be upon us. The synopsis for a lack of pain was straightforward – you didn’t train hard enough. As the seasons skipped from Summer to Autumn, local hills were scaled three or four times per week which, more times than not, also included a “dip” into a seasonally cold lake. 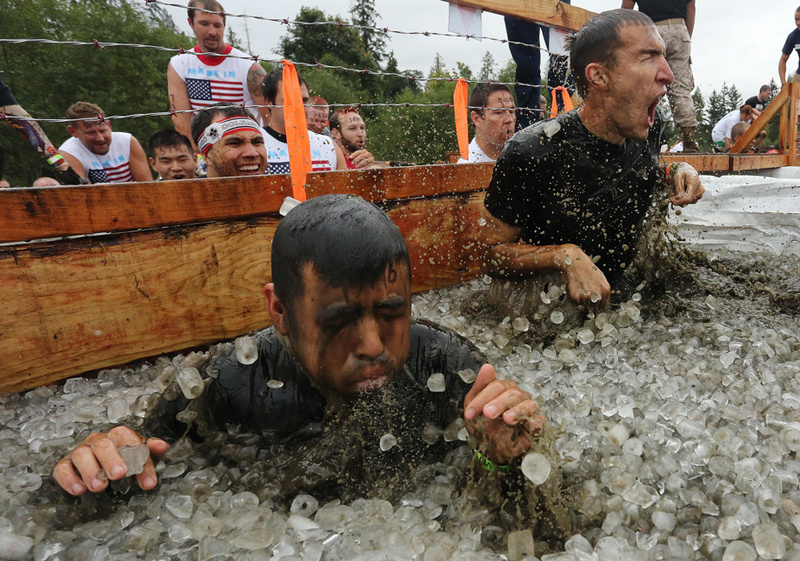 As Tough Mudder pre-requisites go, embracing the idea that you are going to be fully submerged, several times, in freezing cold water, puts you on the right track. Being able to swim helps too… something which a few competitors astonishingly gave minor thought to – a little prep work never hurt anyone. After six gruelling months of training, the big day was upon us. As fate would have it, two of us made our own way to the event, leaving ten others to collectively travel together in a minibus. 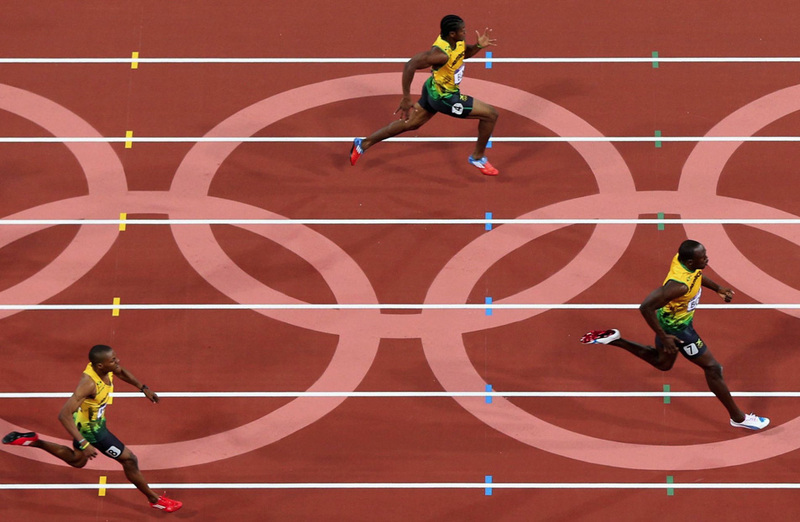 Incredibly, the ‘TM Ten’ never made it to the start line. As per the opening line to this article – “you could not make this up” and I haven’t. Buckle up for a peach of a story. Our team were given an allocated start time of 11.20am. Tough Mudder officials instructed us to reach our destination approximately two hours beforehand so, our designated venue meet was at 9am. At 8am we were on the M6, in the midst of a cocktail brimming with excitement and anxiety. A text message was then received from the skipper which read the following, “We can’t come. The driver fell asleep, kerbed the bus and blew the tyre. We’ve changed it but now it’s too late and we have to take him back as he’s sick. Good thing you didn’t come with us eventually!” Our initial thought was that the text was a prank – minor punishment for not joining the rest of the team on the minibus. Naturally, we replied half-joking – “you’re making this up, see you soon” but the skipper concluded the conversation with, “No I’m not unfortunately. You can imagine the state I’m in” (in particular reference to the dedication he had demonstrated in organising the team over the previous six months). At that point we simultaneously ceased to smile and halted at the next motorway services. Bloody Nora. We contacted one of the other team mates, Gerry, to see if his story was consistent. It was, and his classic line of “you couldn’t make this up” still rings in my ears today. To cut a long story short, The Chosen One (concealing the driver’s identity), is a 30 year-old enthusiastic gym-goer / meathead and he took on the responsibility of driving the minibus for the day. In fact he was PAID to drive – a decent little earner if the truth be told. Our skipper sent him numerous instructions detailing when and where he needed to be, plus emphasised the importance of the day. Frantic nodding accompanied the numerous “OK’s” – ample acknowledgement that the details were understood. The agreed rendezvous was the gym at 0445 hours. 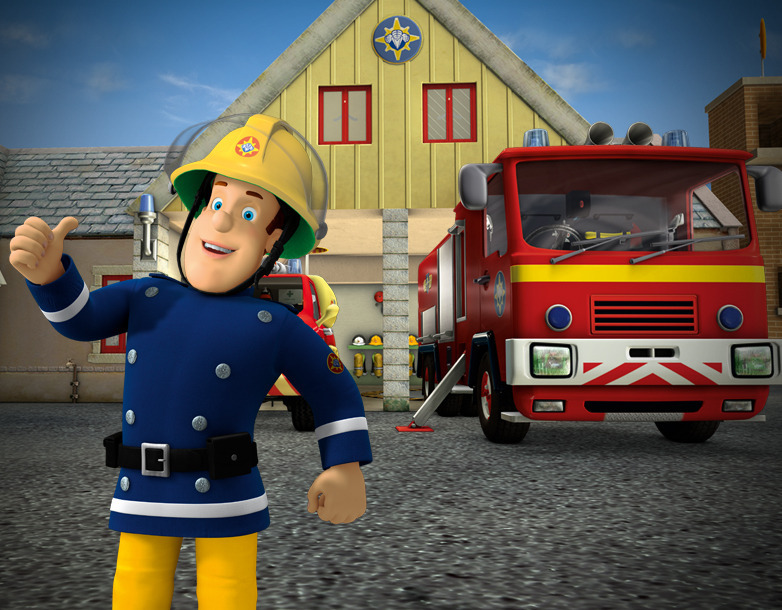 The early start was not a problem for the driver since he is a fire-fighter by trade. 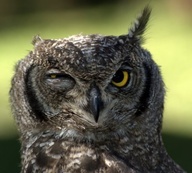 Some might say, only owls would be better prepared for early starts and night shifts. Once arriving at the check-point, the portrait picture containing the disapproving looks on the remainder of the team’s faces told a thousand words. That said, it was no time for finger-pointing, so they jumped into the minibus and sped off, hoping to make up for lost time. This transpired to be a pipe dream. Another kerb was struck and the tyre had had enough. A blow out. The minibus pulled over and the fearful team mates desperately attempted to replicate a speedy Formula One-esque tyre change. To their dismay, whilst they were putting in their best efforts, the driver slouched down on the pavement behind them, stretch out his tired little limbs before he proceeded to curl up into a ball for nap time. Tough day at the office. Realisation then set in that it was bloody late o’clock and barely ten of the designated 200 miles had been covered. The driver’s condition deteriorated and rather than leave him on the street, the team unanimously decided to take him home, writing off six months’ worth of strenuous training – all down to the actions of one shambolic individual. Somewhat harsh – there are no refunds for Tough Mudder non-appearances regardless of the circumstances. In addition, costs incurred due to minibus damage was further reward for the team’s early morning debacle. Meanwhile, 200 miles north, we, the sole representatives of the team, trekked towards the “Toughest Event on the Planet”. A 12 mile mud run, complemented by 25 obstacles. Thanks to the pitiful race organisers where two hours were wasted driving the last mile to the event, the race started slowly – a result of being car bound for four hours. The first mile was rougher than a badger’s backside, due to a combination of the legs yet to warm up and the merciless, treacherous mud. However, the timing of the second obstacle was perfect. It was the Arctic Enema, which consisted of dropping yourself into a skip full of water and ice, fully submerging under a wooden plank coated in barbed wire located in the middle, to the other side. It was the perfect wake-up tonic as once that obstacle was conquered, the legs kicked into action. After slowly moving through additional water based trenches, where it would have been an appropriate location-setting for the Predator movie, it was time for some lengthy mud runs. There were bambi on ice-esque tumbles supplemented by runners who were wiped out by their own team mates. Laughs galore. The ‘spidersweb’ was next which tested anyone’s boasts that they didn’t suffer from vertigo. Whilst climbing up this thick, mud-soaked cargo net, I couldn’t get the signing of ‘death waiver’ out of my mind since the only thing between myself and a five metre drop to Earth were random clumps of hay. (Summed up beautifully, the death waiver says – ‘Tough Mudder is not responsible for any deaths or injuries – but don’t forget it’s a FUN day). Self-assurance. Further on, there were additional challenging obstacles. Plenty more water, brick walls, greased up monkey bars and, my particular favourite, ‘how many times can you smash your face at full-steam and slide down the half-pipe?’ obstruction). Let’s not forget the electric shocks, of which there were two instances. The first I cruised through (in fact I crawled on a slippery mat). No shocks. “Haha, placebo!” I thought to myself. How naive. The second shock therapy obstacle was the final hurdle to completing the entire race. As I ran confidently through the wires unscathed, I prematurely thought “victory!” A split second later, I felt something akin to a cricket bat connecting square-on with my head. Needless to say, this ensued a face first tumble where I ate mud, whilst my fiancé looked like a Queen Bee had ravaged her neck. Up I got and we stumbled the last few metres of the course. Triumph. Overall, the accomplishment of running 12 miles, through deep mud and overcoming 25 obstacles was highly satisfying. 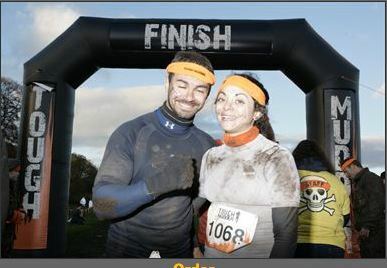 I did enjoy the day but from my own perspective, once you have run a Tough Mudder there is a distinct lack of desire to participate in another – unless that’s the kind of thing which floats your boat. A fun day was had by all (maybe not by the guy being attended to by the St John Ambulance at the halfway point) but we were aggrieved that there were no cleaning facilities at all – something which was available in the recent Australian event. It’s not a great deal to ask for considering the substantial amount of money required to participate. Spare a thought, though, for our team mates who did not even get close to the start line and had none of their hard-earned pounds refunded. They will, however, be entering next month’s Tough Mudder in the Midlands. After a year of training, and as long as they stay out of harm’s way, it will be one to savour.